Looking for a new way to use the abundance of cherry tomatoes in your garden that ripen all at once? I have several varieties planted, which includes some small grape tomatoes with tough skins. This gives my sauce a little extra chewiness, but I just call it “rustic.” My yellow pear tomatoes have nice thin skins, so they are a little less detectable. If you don’t like the tough skins, you can either give the tomatoes a spin in the blender or use an immersion blender before adding them to the pan. In a dutch oven, or large pan, saute shallots in hot oil (can use vegetable broth if avoiding oil) over medium heat until they begin to soften; add garlic and stir while cooking for a minute or two; add mushrooms and bell pepper. Stir often while mushrooms and bell pepper pieces cook until they are soft. Stir the spices into the mixture until the vegetables are well-coated and the spices are lightly toasted. Add the cherry tomatoes, turn heat down to low and cover with a lid. Cook for 5 to 10 minutes, until tomatoes are soft enough to crush with a masher. They will ‘pop’ when pressure from the masher is applied. Add the vermouth or vegetable broth, then cook uncovered, stirring occasionally, until the sauce has thickened. Turn off the heat and add the lemon juice, and olive oil if using. Keep the sauce warm. 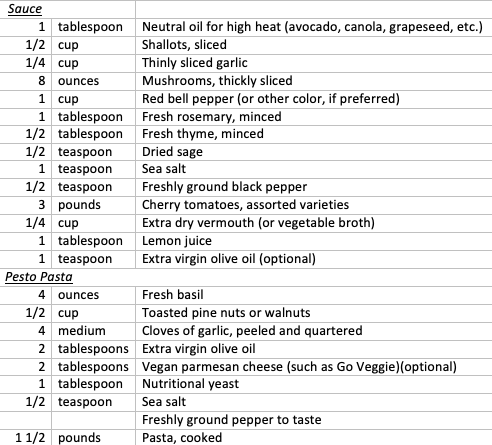 Pesto: add all the pesto ingredients to a food processor or high speed blender, and process until smooth. Add a small amount of water at a time, as needed to create the right consistency (thick sauce). Toss the hot drained pasta with the pesto sauce until well-coated. Top with the cherry tomato sauce and enjoy!